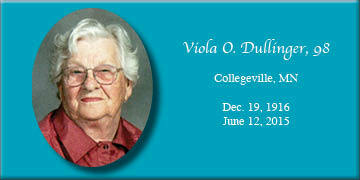 Viola O. Dullinger, 98, of Collegeville, died June 12 with family by her side at Arlington Place in St. Joseph. Her funeral was held June 17 in St. John the Baptist Abbey Church, Collegeville. The Rev. Gregory Miller, OSB, officiated with burial in the parish cemetery. Dullinger was born Dec. 19, 1916 in Kenmare, N.D. to Pius and Barbara (Stich) Gillitzer. They moved to the Collegeville area when she was 18 months old. She was proud to be a life member of St. John the Baptist parish. She married George M. Dullinger on Jan. 16, 1934 in St. John the Baptist church. They lived all of their lives in Collegeville, raising four children and farming. She was a member of the St. Rose Mission Circle all of her life. Dullinger enjoyed sewing, knitting, macramé, quilting, working outdoors and ceramics. She will be remembered as a hard worker with many talents. Survivors include the following: her children, Darlene Ostendorf of Waite Park, Delvin (Lillian) of St. Stephen, Shirley Bloch of St. Joseph, Dianne (Willy) Sobania of Clear Lake; 21 grandchildren; 32 great-grandchildren; 14 great-great-grandchildren; sisters, Delrose Fischer and Delores Neucomb, both of St. Joseph, and sister-in-law, Angie Gillitzer. She was preceded in death by the following: her parents; her husband, George in 1992; grandson, Jeff Ostendorf; great-granddaughter, Kristina Felix; brothers, Walter, Sylvester, Delbert and Delvin Gillitzer; and sisters, Lillian Kuklok, Sally Gaebel, Stella Spychala and Verna Mae Hutchins. A special thank you to Arlington Place in St. Joseph for their wonderful care these last three years. Arrangements were made by Daniel Funeral Home, St. Joseph.